I almost never re-read a book. I’m such an avid reader that my friends find it surprising that I tend to read a book and then pass it along to someone else with no intention of ever having it returned. The thing is, the world is too full of really great books waiting to be read that I hate to re-read a book when I could be discovering something new. There is at least one exception to my “rule”: To Kill a Mockingbird. From my first memory of reading it in about 8th grade until now – some 30 years later – I’ve probably read Harper Lee’s masterpiece no fewer than about twelve times. Unlike other books that I read and immediately pass along to other friends or donate to a worthy bookshelf, I can’t seem to part with my copies of To Kill a Mockingbird. At last count, I had four copies; and I love the story so much that I can’t bring myself to part with any of them. I think I may be adding another exception to that “read a book only once” rule: Oh My Stars, by Lorna Landvik. Wow! What can I possibly say about a book that is dang-near poetic from its first sentence? 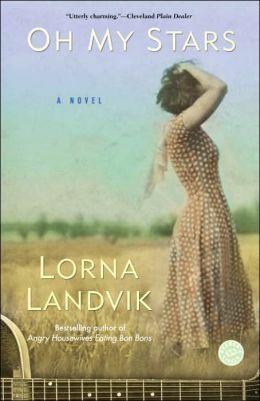 Landvik’s writing style is descriptive in a way that seems to come from a completely different era. By descriptive, I don’t mean the gratuitous droning on for three pages about the landscape that eventually crosses over into the mundane and loses even the most tenacious of readers. I mean descriptive in that her words are quite simply beautiful, yet concise. Through the eyes of her main character, Violet Mathers, I can actually see the colors, hear the sounds (most frequently the bees in Violet’s ears) and the smells of the universe surrounding Violet and her friends, Kjel and Austin. Oh My Stars tells the story of Violet Mathers, a young woman who has grown up in the most unloving and emotionally deprived home imaginable. While still a small child, her mother skips town and runs off with the local pharmacist, leaving Violet with a father who can barely stand to look at her as her very presence reminds him of her lying and deceitful mother. Violet’s life is simply a series of disappointments. She’s unattractive, unloved, poor and has no friends; but she’s able to compensate for those deficiencies by throwing herself into her private world of designing and creating her own clothing. She has dreams of becoming a famous fashion designer, but even those hopes are dashed when she loses part of her dominant arm in a freak accident involving a machine in a thread company where she finds summer employment. Now, without even the talent that has allowed for her escape from the injustices of the world, Violet has nothing. She decides to travel to California with plans to be the second person to take flight off of the Golden Gate Bridge. But nothing in Violet’s life ever goes as planned, and this is no exception. En route to California, the bus in which she’s traveling has an accident that throws her in the paths of Kjel Hedstrom and Austin Sykes, changing the course of her life – and her understanding of who she is – forever. Oh My Stars was simply a beautiful read from beginning to end. It’s a book that will not only find a permanent place on my bookshelf, but is one of the very few that I can see myself re-reading many times over the years. It’s that good! This book is available at the Rochester Public Library in a variety of formats including digital download e-book and audio, traditional format, audio CD and cassette, and even large print.